This week, President-elect Donald Trump took to Twitter to attack one of our own – Chuck Jones, President of United Steel Workers Local 1999 in Indiana. Chuck’s local union represents workers affected by Carrier’s plans to outsource their jobs to Mexico. After Chuck spoke up on behalf of his members and told the truth about the number of jobs that would be saved by the deal struck between Trump and Carrier, Trump took to Twitter. He made a attacked Chuck personally, calling him out by name and he even questioned the role of the union in companies deciding to outsource their jobs. In the aftermath of these outrageous tweets, threats have started to be made against Chuck and his family. Trump picked the wrong person to target. 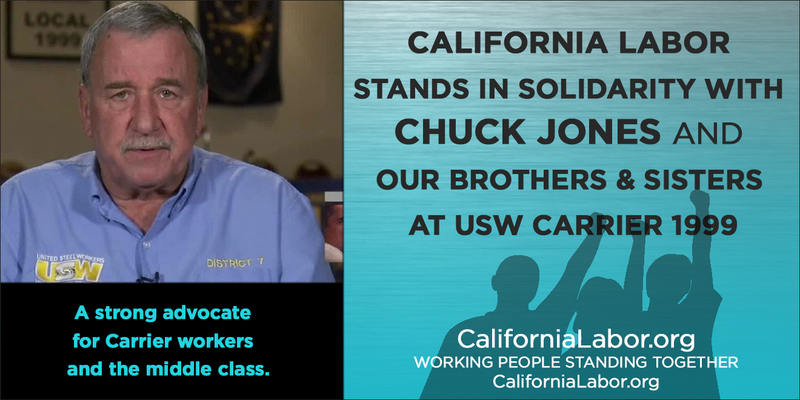 Chuck Jones has been a passionate and tireless advocate for his members and for the middle class. He has fought every day to keep jobs in Indiana. His leadership is a shining example of what we need more of in this country: conviction, integrity, and grit. He has stayed strong throughout this entire ordeal, focusing more on the folks who are losing their jobs than the harassment coming his way. He does not deserve this. An attack on Chuck Jones and Local 1999 is an attack on all working people. It’s unacceptable. The California Labor Federation and the AFL-CIO have put together petitions so folks could send encouraging and supportive messages to Chuck and members of Local 1999. In less than 24 hours, thousands of heartfelt messages have come in from around the country. “Hearing you tell it straight made me stand up and cheer. Thank you for the courage and clarity, Chuck.” In solidarity, -Beth, Member, AEU. Staff, CSEA. 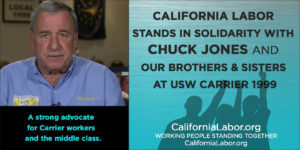 The California Labor Federation is planning on printing out ALL of the messages received supporting Chuck and his local union and mailing them in the coming weeks. There’s still plenty of time to sign- please take a minute to fill out our petition with some encouraging words and we’ll be sure to include them. These are our union brothers and sisters. Let’s show them the Labor Movement stands with them. Sign the petition for Chuck and Local 1999 today!